Anguilla, BWI (July 20th, 2017) – Available beginning in August for Anguilla’s carnival-like Summer Festival, travelers can enjoy genuine Anguillan hospitality in addition to a traditional sailing adventure, multi-course dinner of regional cuisine, locally-inspired spa treatments, and more as part of the Summer Festival Frenzy Package from Anguilla’s Sheriva Luxury Villas & Suites. The luxury experience also includes a private transfer to Anguilla from St. Maarten airport, welcome champagne bar, pre-arrival provisioning, personalized butler services including beach butler on the powder sand at Maundays Bay, an authentic Anguillian memento on departure, farewell cocktail hour and gourmet breakfast daily. Accommodations will be in one of resort’s lavish 8-bedroom villas – Harmony or Infinity – that offer dynamic views of St. Martin and the Caribbean Sea. A highlight of the Summer Festival Frenzy Package is a day voyage aboard Tradition Sailing on a 1978 handcrafted Carriacou Sloop – the last surviving vessel of its kind. The sailing experience begins with welcome mimosas followed by a short introduction and history on the traditions of sailing. Then, it’s off to watch the famous Anguilla boat races before stopping at Sandy Island, an off-island cay, for post-race festivities and snorkeling. After a lunch of local lobster and crayfish, guests will enjoy a tasting of fine rums and cigars. Throughout the day, the group will enjoy premium spirits and fine champagnes such as Cristal Louis Roederer Vintage 2009, Dom Perignon or Petit Jouet Fleur Belle Epoque Rosé while taking in the view of the crystal turquoise Caribbean Sea. 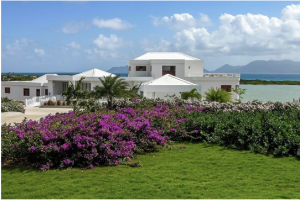 2017 is the year to visit Anguilla as the country celebrates 50 years since succeeding from the Federation of St. Kitts and Nevis to become an Independent British Overseas Territory. From diverse cultural events and local festivals to Island Heritage Tours and more, special events are planned throughout the year to commemorate the Golden Anniversary. The cost of the Sheriva Festival Frenzy Package 4-day/3-night package is $30,000 USD for up to 12 people in one 8-bedroom villa. Viewing of the Anguilla boat races is only available on select dates throughout the year. For reservations and information visit www.villasatsheriva.com, call 954-237-5713 / 264-498-9898, or email info@sheriva.com. Located in the chic area of West End, the award-winning Villas at Sheriva successfully blends idyllic Caribbean charm with contemporary elitist comforts. With dynamic views of St. Martin and the Caribbean Sea, the lavish villas – Mystique, Harmony and Infinity – are a true oasis of elegance and oversized opulence spread across 10 acres. This fully staffed waterfront enclave redefines the art of luxury escapism. Villa rentals start from three bedrooms up to eight bedrooms, with the option to rent the entire 22-room estate. Deluxe golf carts are included for beach jaunts to Maundays Bay and Cap Juluca where villa guests have signing privileges. 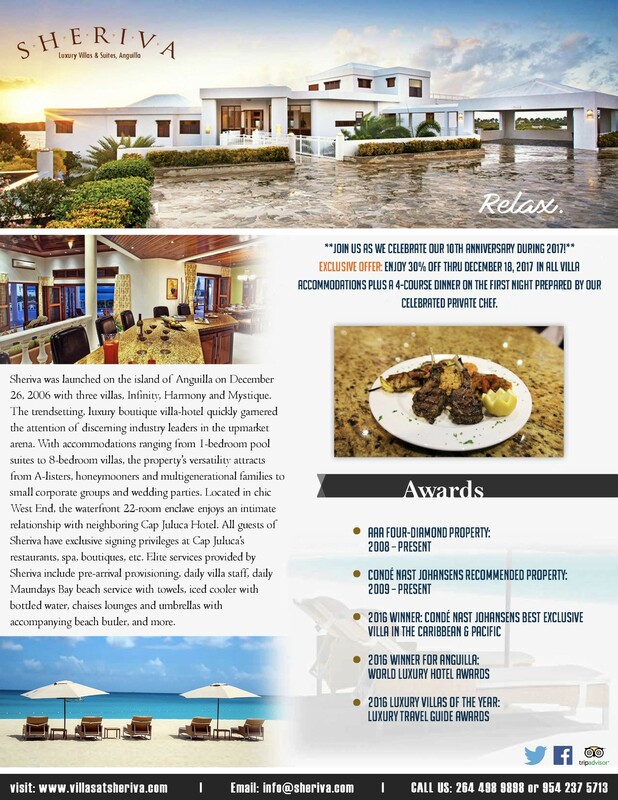 Consistently awarded the distinction of being a Condé Nast Johansens Recommended Property since 2009 and AAA Four-Diamond Property since 2008 – accolades awarded to only a handful of Anguilla properties – Sheriva mesmerizes even the most distinguished traveler. For reservations and information visit www.villasatsheriva.com, call 954-237-5713 / 264-498-9898, or email info@sheriva.com.